In 185 AD, Chinese astronomers recorded a “guest star”. 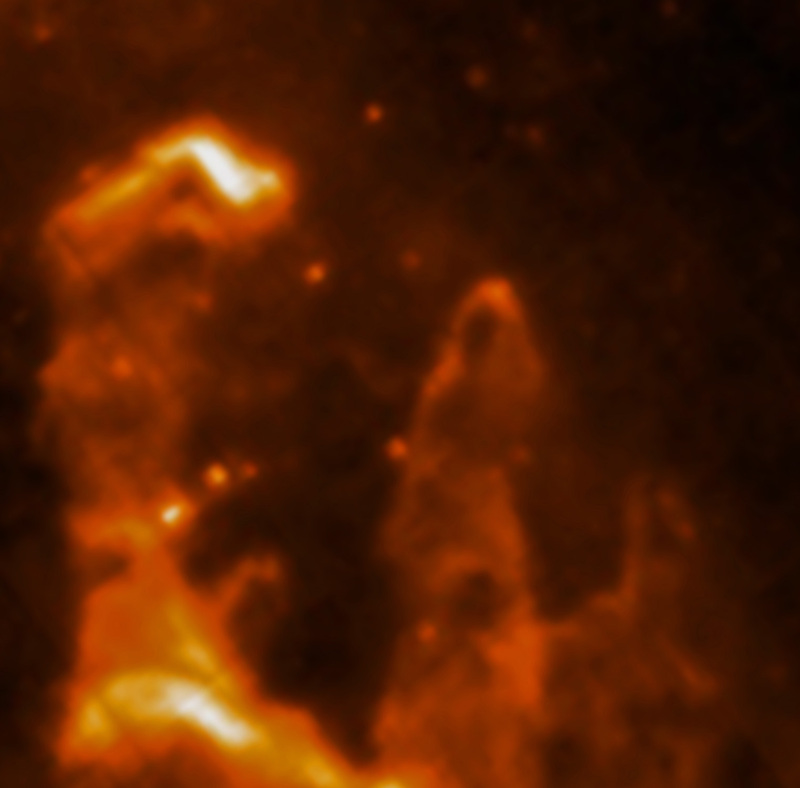 1800 years later, astronomers determined that supernova remnant RCW 86, located about 8,000 light years from Earth, was the leftovers from the explosion of that “guest star”. Seen from Earth, the remnant is larger across than our Moon. This is two to three times larger than expected for a supernova remnant of this age. That mystery has now been solved with new data from the Spitzer Space Telescope and the Wide-field Infrared Survey Explorer (WISE), as well as previous data from NASA’s Chandra X-ray Observatory and the European Space Agency’s XMM-Newton Observatory. The findings have been published in the Astrophysical Journal by Brian J. Williams, et. al. Williams is an astronomer at North Carolina State University in Raleigh, North Carolina. First, the explosion was a type 1a supernova. X-ray data from Chandra and XMM-Newton showed that the remnant contained a large proportion of iron, typical of a type 1a supernova. Second, it seems likely that the remnant rapidly expanded into a “cavity” in space, thus greatly exceeding the usual progress of explosion material. The cavity was the result of a stellar wind blown by the late stages of the star prior to it becoming a white dwarf. This is unusual, and normally only seen in core-collapse supernovae (type 1b and 1c). 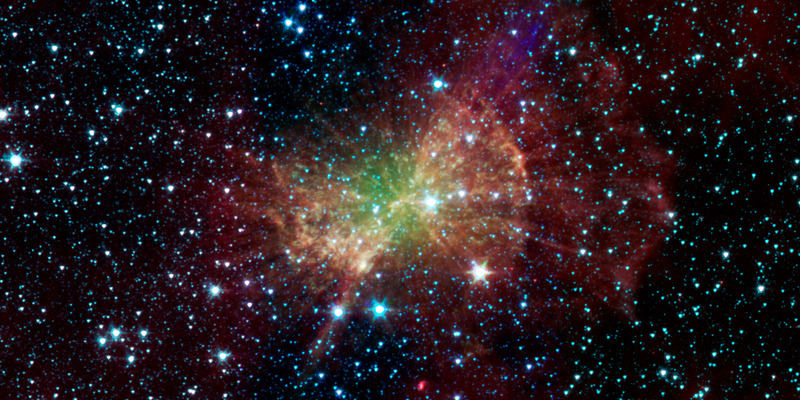 In the image above, red is associated with the dust in the blast wave of the supernova, dust in the background are yellow and green, and stars are blue. The Jet Propulsion Laboratory (JPL) and NASA have released a new image of star formation in the Trapezium Cluster. 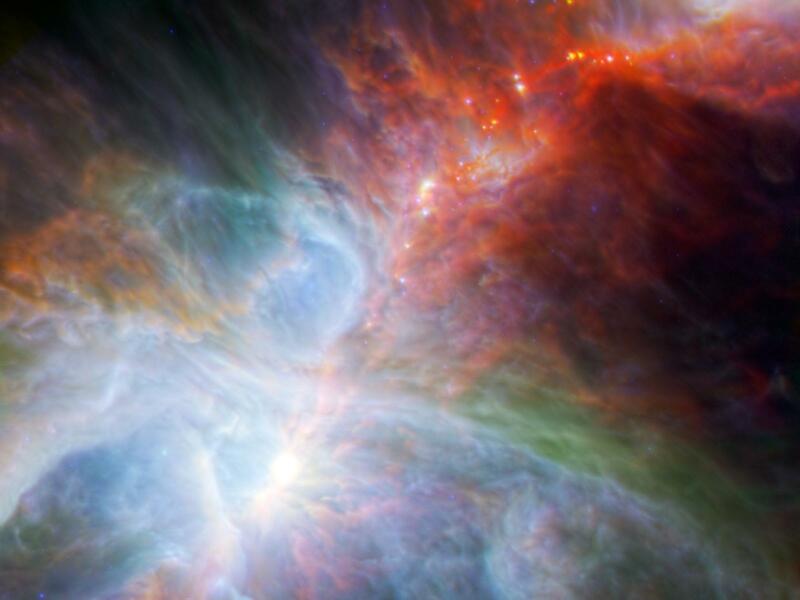 The image is a composite of data in the infrared from NASA’s Spitzer Space Telescope and the European Space Agency’s Herschel Space Observatory. 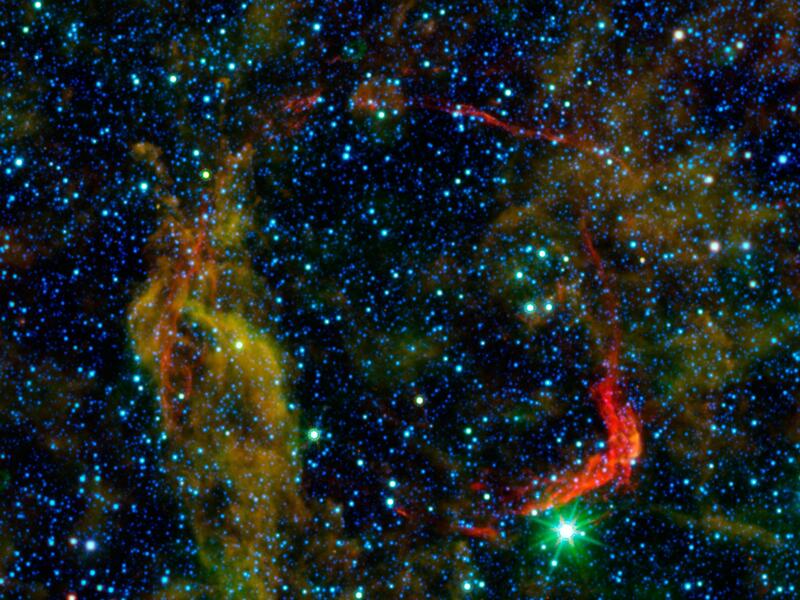 Spitzer observes at shorter infrared wavelengths (8.0 and 24 microns), and the data is shown as blue in the image. Herschel’s data is at longer wavelengths (70 and 160 microns), and is shown as green and red. 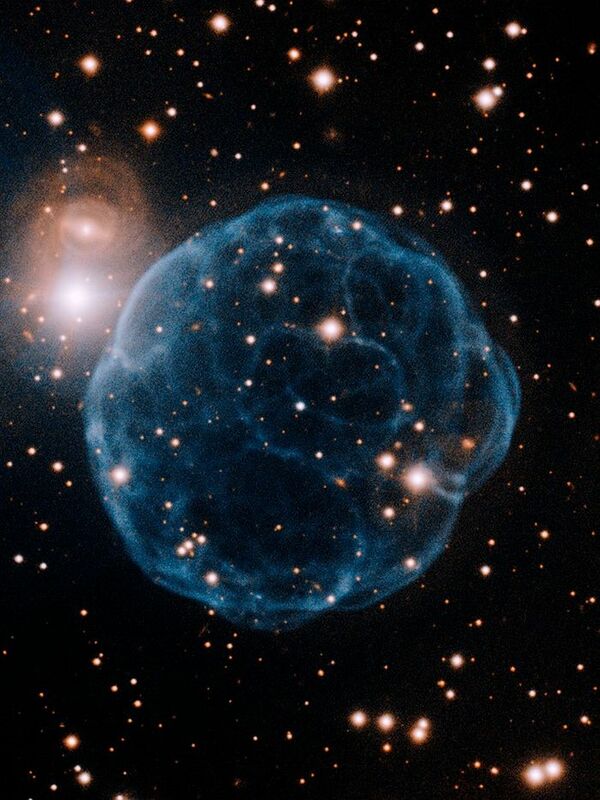 Cool objects such as newly forming clumps that will become stars appear red, whereas hotter embryonic stars appear blue. 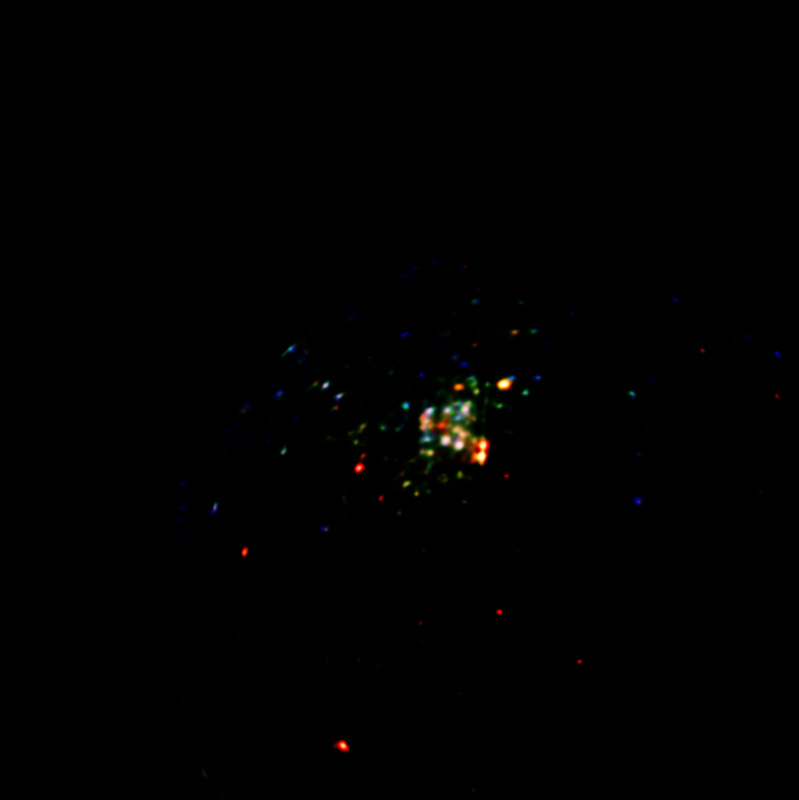 The bright blue region in the lower left is illuminated by five massive stars. The cooler red region in the upper right is the home of the newly forming stars, which may begin their fusion life cycle within the next 100,000 years. 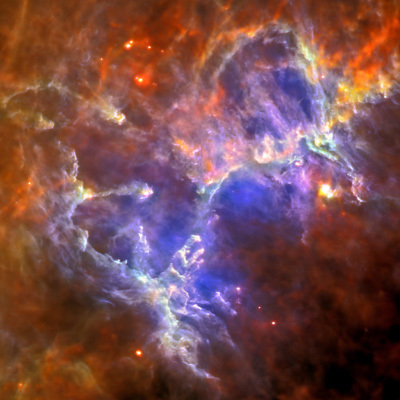 The Eagle Nebula, also known as Messier-16 or NGC 6611, is a nebula visible in the Southern Hemisphere. 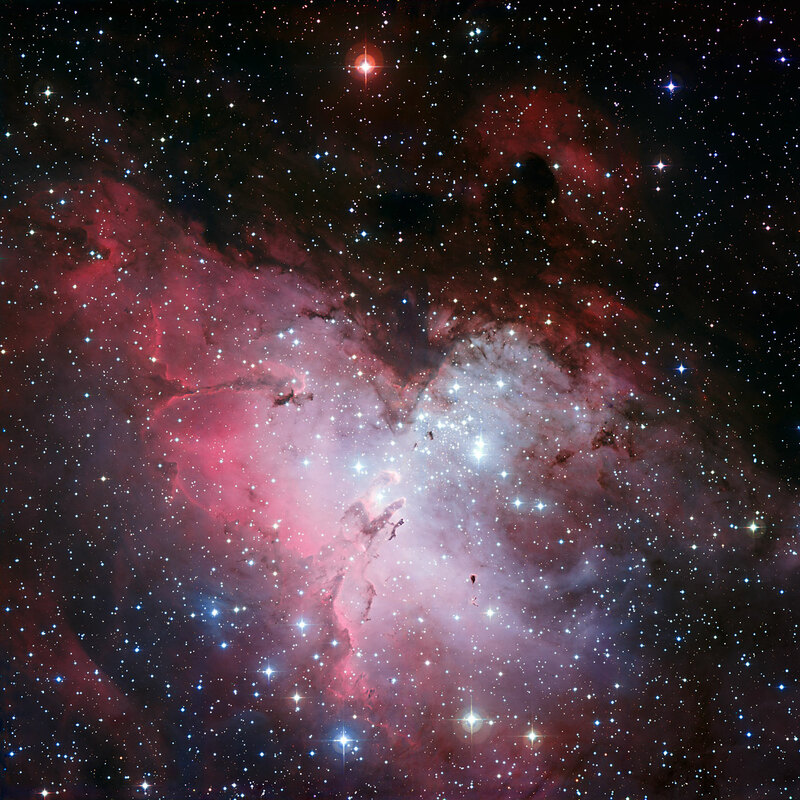 This three color image was taken by the Wide-Field Imager camera on the MPG/ESO 2.2-meter telescope at the La Silla Observatory. One easily sees the Eagle, and at the heart of the Eagle are the Pillars of Creation. The Hubble Space Telescope imprinted the Eagle Nebula in the public’s mind in 1995 with the publication of the Pillars of Creation. The Pillars can be seen above in the middle of the lower third of the image. 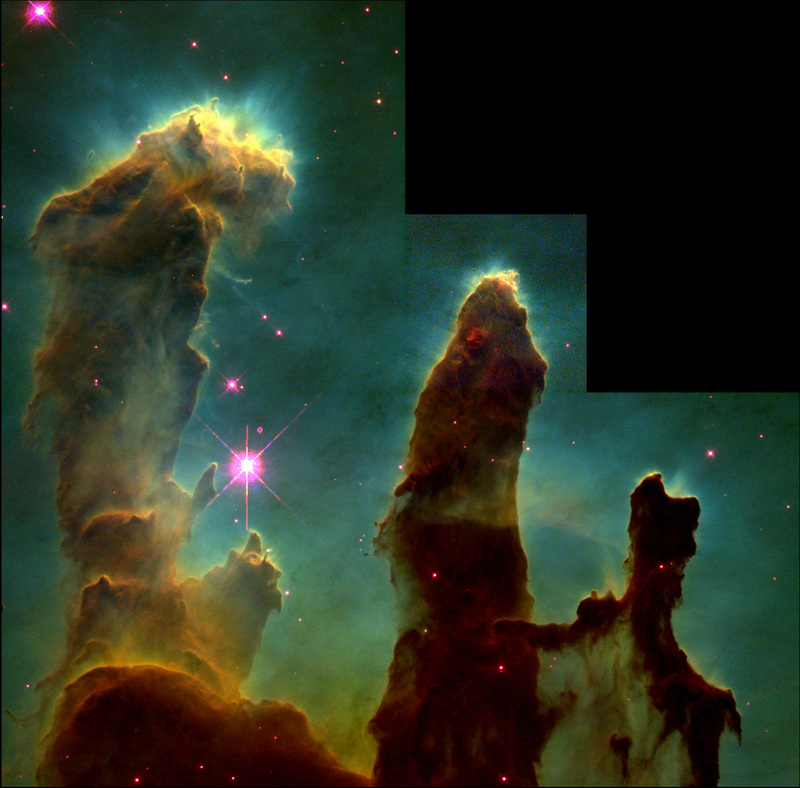 Hubble’s image (below) stands the pillars on end, whereas the ESO image shows them tilted over toward the right. 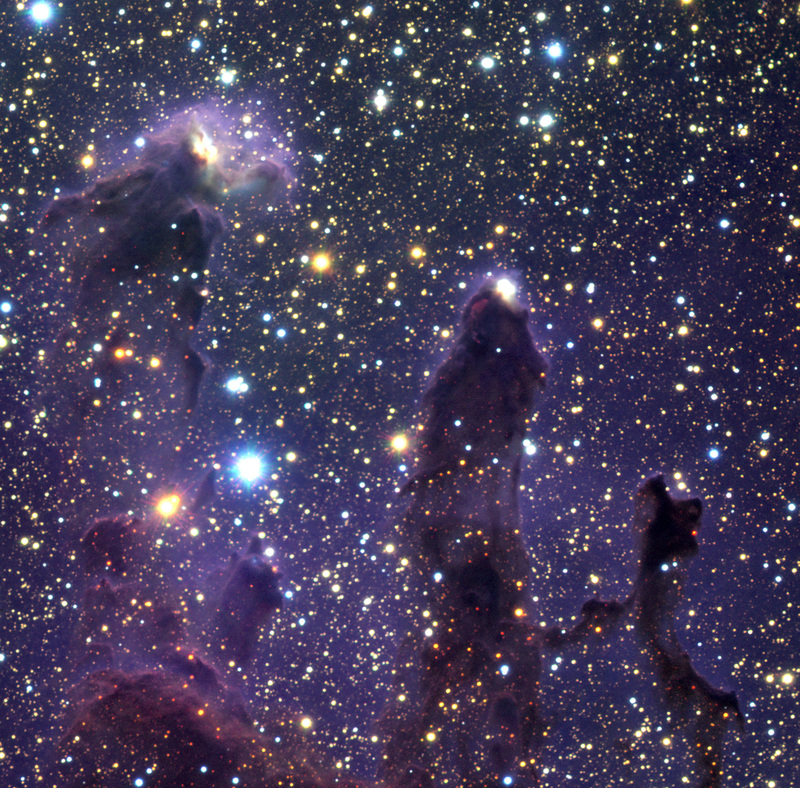 In this composite image (above) of the Pillars’ star forming regions, the tallest pillar is about four (4) light years high. The images were observed using a combination of SII/H-alpha and OIII filters. Other wavelengths allow us to see inside the gas clouds that surround these regions. Up to 1998, the ESA Infrared Space Observatory (ISO) was the most sensitive mid infrared telescope ever built. ISO observations (below) were performed at 7 microns and 15 microns, aiming to detect embedded sources in the pillars. Image Credit: ESA / ISO / Pilbratt et al. Near-Infrared imaging by The 8.2m-diameter Very Large Telescope’s (VLT) ANTU telescope (below), enabled astronomers to better penetrate the dust that obscures the interior of the pillars. This has allowed researchers to investigate the ‘evaporating gaseous globules’ (EGGs) first detected in the Hubble images. It looks like eleven (11) of these EEGs probably contained new stars. One can also see stars in the tips of the pillars. Recently, new images of the Eagle Nebula (below) in the far-infrared and sub-millimeter part of the spectrum have been release by the Herschel Infrared Observatory. The image is color coded. 70 micron radiation is in blue and 160 microns in green from the Photodetector Array Camera (PACS). Red codes for 250 micron emissions using the Spectral and Photometric Imaging Receiver (SPIRE). The image shows the temperature of the dust, which ranges from 10 degrees Kelvin (above absolute zero) to 40 degrees Kelvin. Herschel operates from a Lissajous orbit around the second Lagrangian point of the Sun–Earth system (L2), a virtual point located 1.5 million km from Earth in the direction opposite to the Sun. 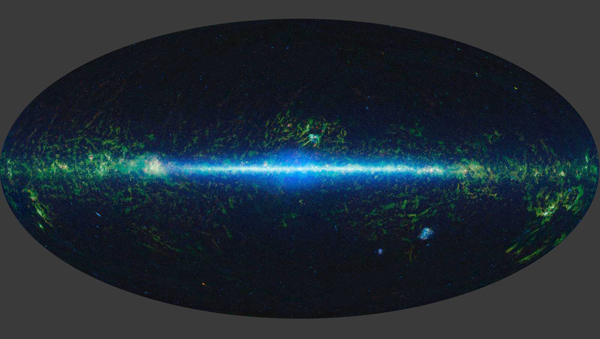 The X-Ray image below was taken by the XMM-Newton Observatory, which was launched in 1999. The image is color coded for the different energy levels observed: red: 0.3–1 keV, green: 1–2 keV and blue: 2–8 keV. Researchers are investigating a theory that the Eagle Nebula is being powered by a hidden supernova remnant. They are trying to detect a faint X-ray emission in the nebula. If no emission is found beyond what the Chandra and Spitzer Observatories have already detected, this would support the supernova remnant theory. 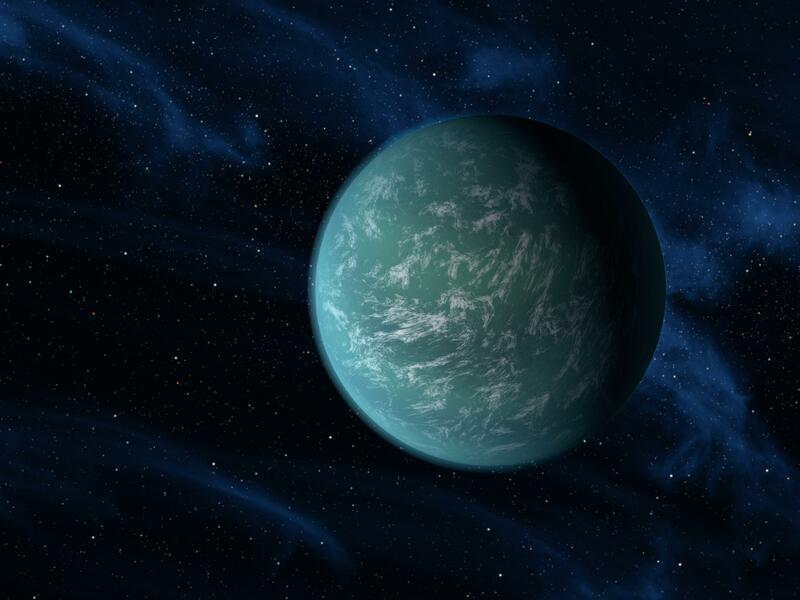 NASA announced the discovery of an Earth-like planet located 600 light years from Earth. “Just a stroll to the local gas station for a candy bar” compared to the size of the Milky Way galaxy we inhabit. Scientists have discovered a new planetary nebula around a star named Kronberger-61, after its discoverer Matthias Kronberger, a member of an amateur astronomy group known as the Deep Sky Hunters. Planetary nebulae are the last gasps of a dying star, consisting of an expanding glowing shell of ionized gas ejected during the red giant branch phase of certain types of stars like our Sun. 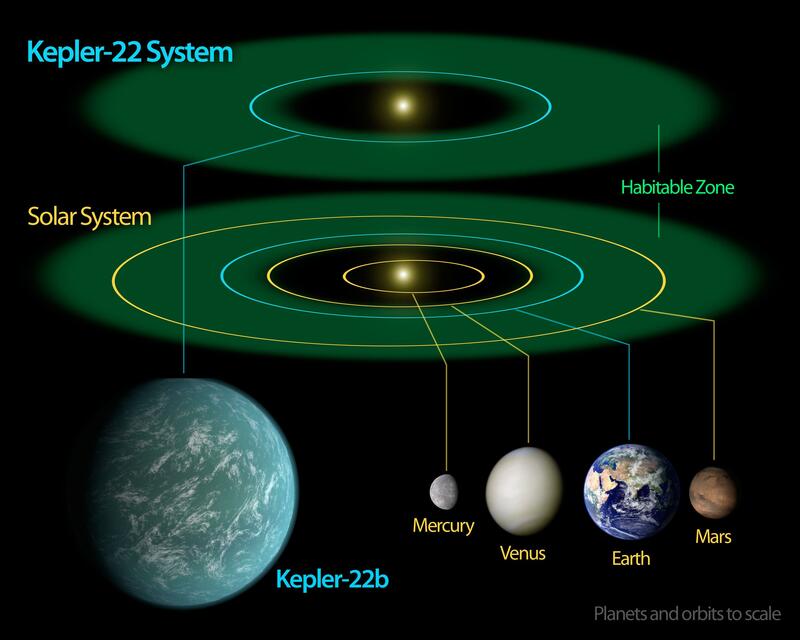 Associate Professor Orsola De Marco from Sydney’s Macquarie University notes that Kronberger-61 is within the field of view of the Kepler Observatory and Kepler may be able to determine if the star has a companion. A companion is theorized as necessary for the formation and structure of a planetary nebula. The Kitt Peak National Observatory in the United States confirmed Matthias Kronberger’s discovery, and the Gemini North Observatory imaged the new nebula (above). The star has been placed on the observation list for monitoring by NASA’s Kepler Space Telescope.